A great option for moms looking to keep the crib mattress clean and dry while providing comfort for you little one. 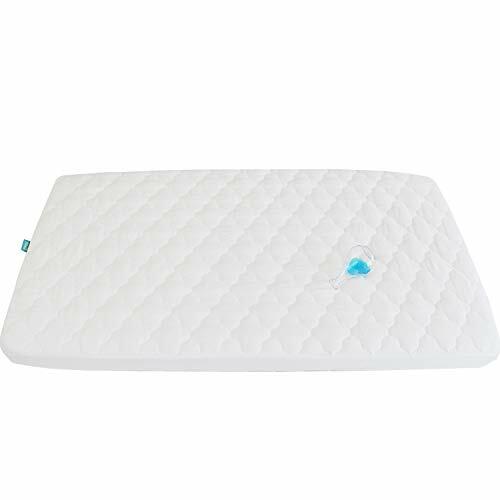 Our quilted play yard mattress pad is made with a surface layer of 100% Cotton with an allergy barrier that is a soft knit fabric backed with ultra-thin breathable, waterproof polyurethane membrane. Specially designed patented extra-deep skirts keep this mattress pad in place at all times, no matter how thick the mattress. You can never have too many mattress pads, so keep several in your linen closet. It is sized to allow for shrinkage and the full skirt is designed for a snug fit. Machine wash and dryer friendly. Premium Protection: Featuring a hypoallergenic 100% soft micropeach sleep surface and filled with soft polyester fiber, no more worry for leaky bottle messes, or potty training misses. Designed to provide advanced relief for allergy and asthma sufferers, and your baby's sensitive skin. Premium Protection: Our quilted mattress protector with extra thick padding for your little feel comfortable yet stay completely safe. Our waterproof layer is made of food-grade TPU that is completely non-toxic and won't make a crinkly plastic noise when your baby moves, and against everyday liquids and stains. Wash Durable and Easycare: Machine wash & dry, for frequent accidents, buy 2 or more - while one is washed, the other protects the mattress. Mini crib protector(27 in x 39 in): Fitted Sheet Style up to 5'' deep fitted stretch skirt made of elasticized fabric that will securely fit standard size crib and toddler mattresses. Biloban's Life Guarantee: Biloban's Quality You Can Trust, if Biloban products does not meet your needs for any reason, Replacement or Money Back, No Questions Asked! If you have any questions about this product by Biloban, contact us by completing and submitting the form below. If you are looking for a specif part number, please include it with your message.